Google announced the Home Hub on Tuesday, its first smart speaker device with a screen. It will cost $US150, and you can preorder it now directly from Google, with availability on October 15th. It has YouTube, can display Google search results, and help you control your smart home gear from Nest and other manufacturers. The Google Home Hub will go up against Amazon’s Echo Show and Facebook’s newly-announced Portal. Notably, the Home Hub does not have a camera. Google announced its Home Hub on Tuesday, its newest smart home device with a screen that comes with new capabilities for viewing your photos, watching YouTube videos, connecting all your smart home devices. The smart speaker will be sold for $US149 and is available for preorder on Google’s site. The Home Hub will be available in four colours, and will be available in retail stores in the US, UK, and Australia starting on October 22nd. Notably, the Home Hub does not have a camera. This means you can’t make or take video calls, unlike home assistants with visuals from Amazon and Facebook. 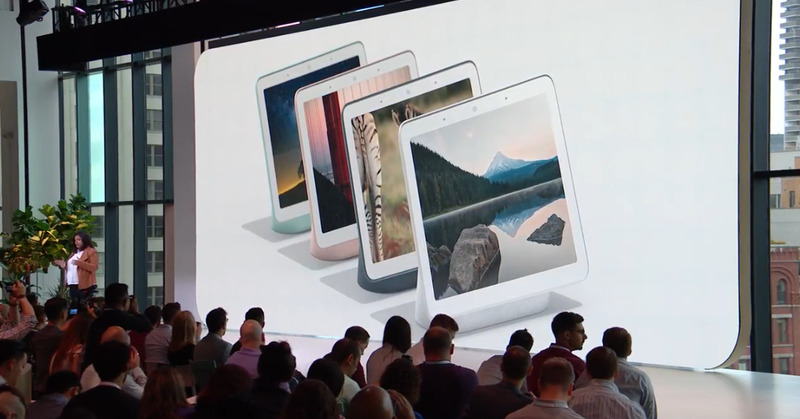 GoogleGoogle Home Hub comes in four colours. The smart speaker will act as the hub of your “thoughtful home,” with a new app that connects all of your smart home devices, Google’s Diya Jolly said at the event Tuesday. Called Home View, the app can control smart devices from thousands of companies and brands, including locks, security cameras, room temperatures, and lights. The device also comes with Ambient EQ technology, which changes the Home Hub’s display based on the time of day and lighting in the room. Additionally, the speaker uses Google’s existing “voice match” technology, which lets Google Assistant recognise each household member and personalise its answers. “Because Hub recognised my voice, it was able to tell me everything happening in my day while I’m finishing up my coffee,” said Mark Spates, Google’s product lead for smart speakers. The smart device can use Google Photos to create “live albums” that you can specify to include specific people, and technology that will display only your best photos while removing ones that are blurry, duplicates, or poor quality. The Home Hub will come with a free six-month subscription to YouTube Premium, which lets viewers watch videos ad-free and access the YouTube Music streaming service. This is Google’s latest product in its line of Home smart speakers, which kicked off with the eponymous speaker two years ago. All come built-in with the Google Assistant, which can provide users with information on weather, news, your personal commute and schedule, and other important data. The Home Hub looks like Google’s response to the Amazon Echo Show, which was first released in June 2017, and updated only a few weeks ago. However, users are unable to access YouTube on Amazon’s device, after Google pulled the app from the Echo Show last year. The updated version of Amazon Echo Show costs $US230. It will also go up against Facebook’s newly-announced Portal video-chatting device, which starts at $US200. Again, though, the Home Hub doesn’t have a camera, a decision that Google made “consciously,” said Jolly, VP of product management. Another Google-powered smart visual speaker does already exist on the market. Lenovo released its Smart Display earlier this year with built-in Google Assistant for $US200. However, the Google Home Hub is the first made by Google itself.